My review of The Ocean Dark, a fast-paced and well-written thriller by first-time author Jack Rogan, is now up on Bookgasm. Because we all love the comments sections - the place for conversation. Point taken: every cause known to man now has a month. Some are just downright absurd, but other warrant pause. September, for example, is not only Roald Dahl Month, it's also Library Card Sign Up Month. Though I'd argue that the ALA is desperately in need of a catchier title for this event, I'd also say it's a worthy cause - there's nothing like owning a library card. Disagree? Don't worry - the ALA has already come up with 52 Ways to Use Your Library Card (one for every week of the year!). Free internet, for when your overpriced internet service provider craps out. Again. I'm talking to you, Comcast. Audiobooks, the perfect companion for travel and commutes. Do you get nauseous reading on the bus? Me too. I check out digital audiobooks from my local library and have them on my iPod for most Bolt Bus adventures. Commute an hour to work? Me too. I have multiple books-on-CD in my car to keep me entertained, with the added bonus of making me almost glad I missed that green light, so I have extra time in the car to find out what happened. DVDs. This collection will vary depending on library budgets, which are subject to drastic cuts, but most libraries do have some sort of DVD collection. And free is infinitely better than whatever Blockbuster charges these days. Book recommendations. In a book rut? Ask the experts. Librarians are way smart. I should know, my cousin is one (almost). Ebooks, although it can be a bit tricky to get the formatting to work properly. Clean public restrooms. 'Nough said. And that, dear friends, is my ode to libraries. What am I missing? The previous URL should redirect automatically, but there are some glitches in that forwarding process. The RSS feed should continue to work as always, fingers crossed. Please let me know if you come across any difficulties or anything looks strange on your end. 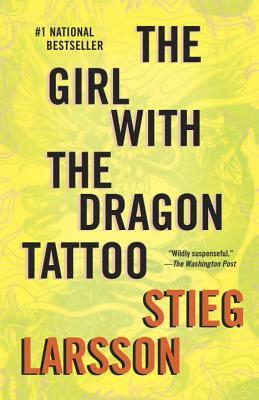 Out of little more than sheer curiosity, I finally picked up The Girl With the Dragon Tattoo. Despite my biases – I tend to avoid books that “go viral,” however unfair that might be to the book – I’m glad I did. Not that it gave me any insight into why, exactly, the trilogy is so ridiculously popular, but because it was an intelligent, well-written, incredibly well-thought-out mystery – something sadly quite rare in the post-Agatha-Christie world of the mystery novel. But Larsson has succeeded in repurposing Christie’s formula in the modern world, combining family drama, murder, conspiracy, politics and journalism in a complex whodunit. Set in modern-day Sweden, The Girl With the Dragon Tattoo begins with the story of Mikael Blomkvist, a journalist recently convicted of libel. With his life crumbling around him, he is invited to the home of Henrik Vanger, an aging millionaire with money to spend and a mystery to solve, and offered a two-part job: write the scandalous history of the Vanger family, in all its infinite jealousies, rages, and spats; and solve the mystery of the disappearance of Henrik’s neice – in 1966. I can’t go much farther into the plot without giving too much away, as the complexities of Larsson’s narrative weave together inextricably. Suffice it to say that murder is discovered, or uncovered, or re-discovered; security companies are brought in; a street-tough girl becomes an ace researcher; and Blomkvist finds himself smack dab in the middle of his own whodunit – trying to solve Harriet’s disappearance amidst a family of corruption, insanity and rage, while avoiding threats to himself and his partner as they start to ask the wrong – or maybe the right – questions. Larsson’s writing is smart and engaging, and he uses setting to his full advantage. There is no doubt that the novel is set in Sweden – and not just because all of the characters have strange names. The setting comes to life on the page, with vivid descriptions of place and atmosphere, whether it be an upscale loft space in Stockholm or a tiny fishing village in Hedestad. To say that the novel is nothing more than an adaptation of the classic mystery scene is to understate the uniqueness of Larsson's creation. Yes, Larsson draws on recognizable elements of the classic whodunit - lists of suspects narrowed by the list of people trapped on an island during Harriet's disappearance, for example - but deftly combines these tactics with the suspense and intrigue of a modern murder mystery, incorporating corporate conspiracies and disfunctional families, bureaucratic iniquities and journalistic integrity in one sweeping story. Bottom line: Looking for an intelligent take on the murder mystery recipe? Looking for suspense that doesn’t involve the FBI? Looking for a family saga with intrigue and secrets? Larsson’s novel will deliver. Be prepared to flip back to the family tree at least once a chapter, and brace yourself for some violent scenes, but as long as you have the patience and the stomach for both, you will find yourself caught up in the story, pulled into a vivid Sweden and a truly engaging, if dysfunctional, family history mystery. This post wraps up BBAW, albeit a bit belatedly. To end the week, our topic looks forward, rather than back, asking about our goals for the next year. 1) A blog re-design: While I'm happy with the simplicity of the current layout, there are some things I'd like to change and a few features I hope to add. This will take considerable learning on my part, as up to know I have relied heavily on the Blogger templates and options available, but I'm looking forward to it. And before you ask, yes, I've already backed up my content. I do so regularly - you should too. 2) Better content: I've pushed myself to post regularly, and I'm proud to have done so (with a few notable lapses, I know). But too many times I have read back through older posts and cringed at having put that into the great wide web. I can do better, and I'd like to make it a point to do so, even if that results in less-frequent posts when life gets in the way. I'm open to further suggestions, of course, as I do this for those of you who (miraculously, I still think to myself) actually do read my blog. That, and this way I can get all my book-ish opinions collected in one place without inundating my poor fiancé with them, because bless his heart, he's very patient, but sometimes likes some peace and quiet, too. We all love to see a new book picked up by the blogging community, spreading like wildfire from one blogger to the next, right? We’ve watched it happen with summer hits like The Passage (don't get me wrong, I loved it) and The Girl Who Kicked the Hornet’s Nest, and now we’re watching the Freedom buzz-machine, with the likes of Jennifer Weiner and Oprah joining the mix. But what of the books that get lost? The oldies-but-goodies, the new books we didn’t catch amidst the rest of the sparkly, glittery frontlist that publishers are offering? 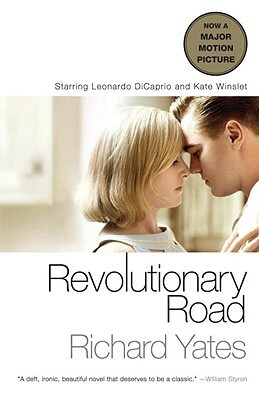 Of the oldies-but-goodies, I’d pick out Revolutionary Road, which I read and reviewed last September (which counts, because it was after last year’s BBAW). I said it then, and I’ll say it again – Yates is a clear, crisp, and insightful author, offering up a melancholy, depressing view of married suburban life, and the consequences of trying to be like everybody else. The novel is only further driven home by the sheer believability of the story, though we like to think that such disasters happen only in fiction. 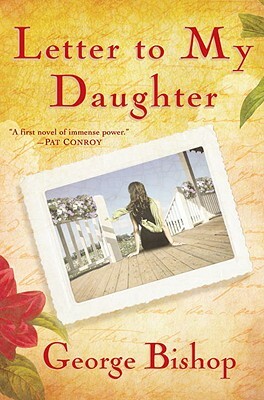 Letter to My Daughter is an almost inconceivably well-written novel of a mere 120 pages – 120 pages of a letter written by a worried, fraught mother to her daughter, who has run away. Rather than focusing on the missing child, the mother’s letter seeks to explain that really, she understands how difficult it is to be a teenager struggling under her parents’ grasp – she did it too. Heartfelt and striking, this will be appreciated by any mother or daughter, or even father or son. And most impressive of all? It was written by a man who so perfectly captured the essence of teenage-girlhood that I’m still reeling, 8 months later. Read my full review here. 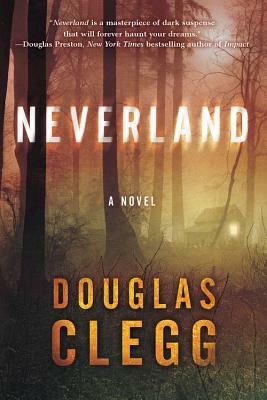 Neverland, by Douglas Clegg, was actually a new edition of a previous horror novel. Clegg himself explained in his comments on my Bookgasm review that upon the original publication nearly 20 years ago, the novel practically disappeared. The new edition is revised, and includes horrific and stunning line illustrations. Not for the faint of heart, Neverland takes reality and nightmares and childhood games and mashes them together into a downright chilling horror novel. Read it with the lights on and love the shivers. We all know book bloggers - like yours truly, here - like nothing more than to convince someone else to read a book they otherwise might not have picked up. Sure, it's also nice to have book conversations, talk about new books we're all jointly excited for, and the like. But really, fellow book bloggers, aren't you giving yourself props every time someone reads a book just because you told them to? Don't deny it. You love it. So, in this spirit, today I'll be talking about the books that I have read on a fellow blogger's recommendation. And I'm going to admit, this is hard. 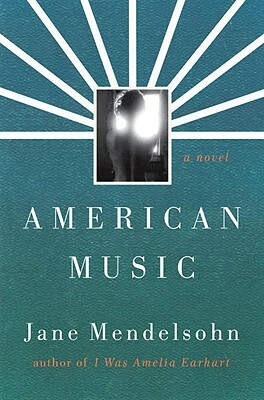 There are a lot of books I want to read because of other recommendations - American Music comes to mind, after reading Rebecca's glowing review at The Book Lady's Blog, as do numerous titles recommended by Thomas at My Porch (he always has books I've never heard of), and In the Train, as recommended at The Dewey Dives and The Dudes. But a book I've already read because of other blogger's recommendations? Only one comes to mind. Not because there aren't more, but because I read so haphazardly that I rarely remember the "why" of a book's journey to my shelves. This one stood out, though: Day for Night, following Boswell and Books' review in February. 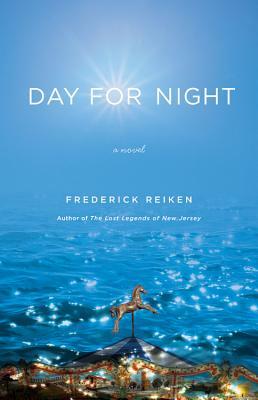 And I didn't regret that decision in the least; I absolutely loved Reiken's latest novel. And can I just say that I hope you'll read it too, based on my or Daniel's suggestion. Or Rebecca's, because she reviewed it too. Because we all get a thrill when our recommendations don't fall on deaf ears, and actually convince people to read something new. Anyone who tells you otherwise is selling something. * But then, they are probably selling books, so listen to them anyway. *Credit to The Princess Bride. Day 2 of BBAW focuses on a new treasure. Today I'm offering up an interview with Nicole at Tribute Books Blog. You can see my answers to her questions on her own BBAW post today. 1) What prompted you to start your blog? Anything in particular? I started Tribute Books Reviews & Giveaways as a way of giving back. I am the owner of a small publishing company, Tribute Books. In terms of marketing and promotion, I am constantly asking bloggers to review our titles. I thought I could return the favor to those also looking to have their books reviewed. 2) What would you consider your best blog post, the one you are most proud of? Why? The blog post I am most proud of is my review of Silent Girl by Tricia Dower because I loved working with the author's references to Shakespeare's greatest heroines. 3) What do you look for in other people's blogs? I like a clean, easy-to-follow layout that is updated on a regular basis. Large type and frequent paragraph breaks also allow for easy reading. I like reviews by bloggers who provide a whole new way of looking at a book - one I never would have thought of on my own. 4) I know it's impossible for most people to pick a favorite book, or even a favorite author, so instead - what's the one book or author that you find yourself going back to again and again? I always find myself going back to L.M. Montgomery's Anne of Green Gables series when I need a good comfort read. 5) In that vein, do you re-read books, or only visit them once? I usually re-read a book or refer back to it when the movie version hits the cinema. I like to compare and contrast what was left out, changed, added, etc. 6) How do you pick which books to read next? When reviewing books for Tribute Books Reviews & Giveaways I read them on a first come, first served basis unless one is for a blog tour that requires a post on a particular date. Those waiting for a review can always check the Future Giveaways column on the blog to check their book's current standing. 7) Of your reading, how do you decide what to blog about - or do you blog about all of them? I blog about the books people send me to review. I always blog about them. The books I read on a recreational basis, I do not review on the blog - they're just for fun. 8) What started off your path as a reader? I started reading at age four when I was able to read on my own a Sesame Street Little Golden Book about Grover that I received in a Happy Meal. 9) Name one thing we wouldn't know about you from your blogging. I love to be surprised by experiencing an absolutely fantastic book that I never heard of before it landed in my mailbox. I'm interrupting my regular posts this week (ok, fine, they haven't been that regular, but cut me some slack?) in honor of BBAW - Book Blogger Appreciation Week. Originally founded in 2008 by Amy at My Friend Amy, the event(s) is(are) designed to promote book bloggers across the web, and generally get them recognized as legitimate, intelligent, book-loving people. At least that's what I understood, but maybe I should let Amy speak for herself? Check out her description of the event here, or in a recent interview at The Book Case. The first post of this week discusses a book blog I've discovered in the last year. I recently posted a few links to blogs and posts I recommended, so at the risk of repeating myself, I'm once again giving a shout out to Greg at The New Dork Review of Books. Greg, can you tell I have a blog crush, here? I literally skip over the rest of the blogs in my reader when Greg posts a new article or review. Yep, he's that good. Insightful, witty, and (ok, I'm biased here) with book tastes similar to my own, his blog is more than enjoyable. And expect lively discussions in the comment section. 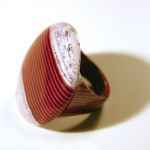 And, not surprisingly, it was short-listed this year for the Best Literary Book Blog for BBAW. Ok, so... I've laid my blog-admiration soul bare. What other blogs do you recommend (book or otherwise)? "Liber delectation animae." -Latin for Books, the delight of the soul. An inscription on the ceiling of the Librarian's Ceremonial Office, the previous office for the Librarian of Congress. Located in the Thomas Jefferson Building. For more quotations and inscriptions from the Library of Congress buildings, check out On These Walls, a beautiful book of photographs and captions exploring those gorgeous halls of books. (Note: the book would make an excellent gift for any booklover or library enthusiast you may know). You can also hear the author speak about the book in this NPR spot. Great Photo Friday: Wrong Bookstore? This has been circulating the internet for a while now, so you might have already seen it, but it is just too fun to pass up. I recently saw it appear on the FAIL blog, and again on The Dewey Divas and The Dudes. So just make sure you go to the right bookstore this weekend. Happy Friday! According to the lovely, couldn't-live-without-it Writer's Almanac email from this morning, today is International Literacy Day, a day founded by the UN in 1966 to keep literacy and reading at the forefront of nations' agendas. Literacy is a cause for celebration since there are now close to four billion literate people in the world. However, literacy for all – children, youth and adults - is still an unaccomplished goal and an ever moving target. A combination of ambitious goals, insufficient and parallel efforts, inadequate resources and strategies, and continued underestimation of the magnitude and complexity of the task accounts for this unmet goal. UNESCO statistics suggest that a staggering 1 in 5 adults is illiterate, with a disproportionate 2/3 of those are women. 64 million children are currently not enrolled in schools. You can read more about UNESCO's aims to reverse these trends and their thoughts on the importance of literacy at their Literacy/Education website. "I'm not sure I'm comfortable living in a world where Bristol Palin is considered a 'star' and a best-selling author is not. And that has nothing to do with politics." - Briea Brissey, discussing "Dancing With the Stars" lack of author representation in their selection of stars over 11 seasons. Read the whole article in Entertainment Weekly's Shelf Life blog. A few months back, I posted about a company that turned old books into purses - to mixed responses. There are those that found the book purses really cool, and others that balked at the idea of tearing apart a book in order to make a fashion accessory. 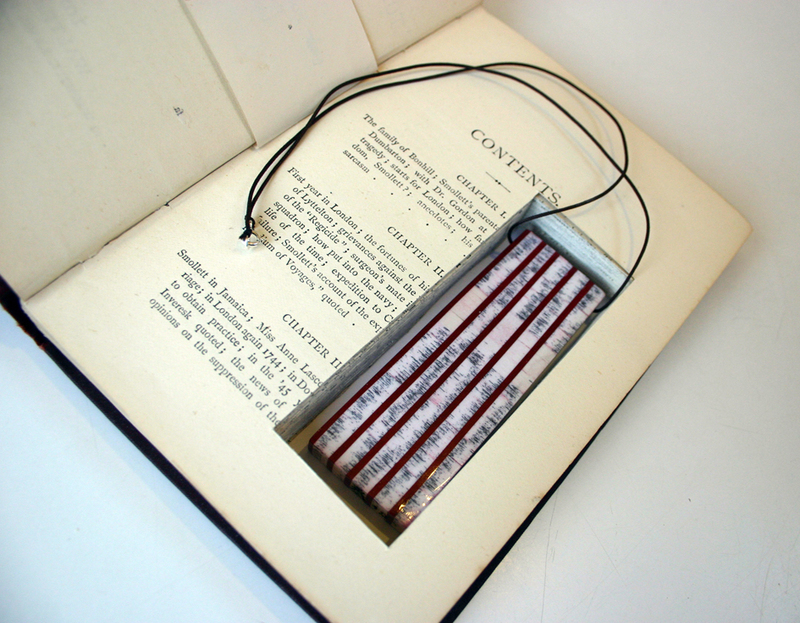 Well, I'm back at-cha with another book-as-wearable-art site, this time turning pages and pages of a book into jewelry: Littlefly. What are your thoughts? Awesome way to display the written word, or too much book destruction for you? Many thanks to Shelf Awareness, who originally posted the link. 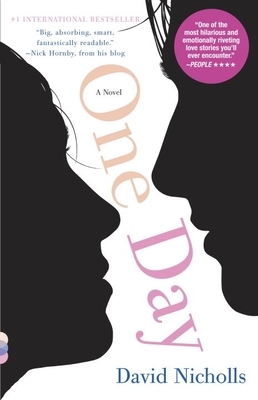 Congratulations to Sharyla, from A Bookish Wonderland, who was the winner of my giveaway of an ARC of David Nicholl's One Day. Thank you to all who entered, and if you didn't win, I still highly recommend going out and finding yourself a copy of the book. It's been ages since I reviewed a book (it's been ages since I finished a book... which is quite a bother), but I did recently review one for Bookgasm: Swords and Dark Magic, an anthology of fantasy and swordplay stories. The question I posed to myself back on April 29th, Day One, was what is it about James Patterson that compels a staggering 14 million human souls to purchase and read his books each year? What is that intangible element that allows him successfully produce 9 books a year and be the highest paid author on the planet? Why are so many people not just content with but frothingly ecstatic over reading his books? Seth, you are a more patient soul than I. Let's just say I'm not much of a Patterson fan to begin with, although I admire the man's ability to turn himself into a brand and churn out over half a dozen books a year. I admire, on some level, anyone that can make writing as profitable as Patterson has done (he's the highest paid author in the country, according to a Forbes article). But, most important to me, I do not admire Patterson's actual writings. What's more, the only redeeming quality I've found in Patterson is the page-turning, plot-driven aspect of each novel. I can't imagine actually focusing on the writing so closely, one chapter after another. Seth's journey through the mind and pen of JPatt is sarcastic and hilarious, well-written and quite thorough. You can follow him from Day 1 here, or if you don't even have room in your life for 117 blog posts about dear Mr. Patterson, let alone 117 chapters, you can just read his final thoughts in Day 117. Any fans of Patterson out there that want to talk me out of my probably unfair and biased opinion here? Has anyone else seen Seth's blog? Has anyone else done this? I have vague memories of someone doing a similar project with The Da Vinci Code (another of my not-so-favorites, even if that does make me a snob), but a quick search turned up nothing. For more on James Patterson as brand, check out this NY Times article: James Patterson, Inc.
Greg at The New Dork Review of Books also discussed the pull of Patterson in a previous post, "Juxtaposition: Profiles of David Mitchell and James Patterson"